The Cremation Society of New Hampshire provides a number of resources related to cremation, death and what to do when someone dies. This page contains links to information about what to do when someone dies, obtaining death certificates, social security benefits, body donation, memorial service planning and more. Find answers to the most frequently asked questions about cremation and what your payment options are for your cremation or that of a loved one. 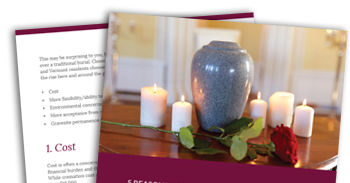 Find answers to the most frequently asked questions about cremation. When you are dealing with the loss of a loved one, you may not know what you need to do. We provide clarification of the process on both a local and national level. Paying for a cremation can be expensive. When you add a graveside gathering or memorial service, the cost can increase even with our extremely low prices. Find out what your payment options are for your cremation. You don’t have to be a writer to craft a beautiful obituary for your loved one. This helpful step-by-step guide will walk you through it. Information about transporting cremains by means other than your own vehicle. Learn more about social security death benefits, including eligibility and application. There is a great deal of planning that goes into a memorial. This checklist will provide you with everything you need to know and all the steps you need to take. We’ve compiled a large directory of the most common forms that you may need when planning final arrangements or after a death. If you or your loved one served in the US military, you may qualify for certain veteran benefits, including financial perks and recognition services. Understand the different options for donating your body after you die. We maintain a drop-box for anyone who has an unserviceable American flag and wishes to give it a proper retirement. The box is located near the front door of our Hanover Street location in Manchester: 243 Hanover Street, Manchester, NH 03104. Discover the things that may have never crossed your mind. We offer resources to forms as well as our expertise to help you during this important step. Featured here are some classic and popular choices for flower arrangements and tasteful planters to be displayed at the service and gravesite.